My old valve was leaking so I fitted a new one. I could not screw it back as far as the old one and I damaged it by trying with 'gadgets'. My second replacement was the same but it works OK. But during the process I did not know which way round the washer should be. I think I tried the other way ans now it is working I am not going to change it although I think it is wrong. I would have liked you to have included a washer. I would like to know why I cannot screw the valve back as far as the old one--I retried it and it went back correctly. The disk at the back of the new one is loose. I have been using this valve with shatafa for a month and have had no issues at all. I am happy to recommend this product to anyone. It is very useful in temperate countries to have a product where you can turn the water off and isolate it in the main pipe. This is because water does not evaporate and disappear rapidly if there is a leak when it is colder. This valve definitely does the required job. The acid test is to operate the spray with the valve shut off to check for any pressure build-up: none whatsoever so fully recommend this item. Hi I cannot get that part in Ireland and it's worked great very happy with this product. Would recommend and good postage service. 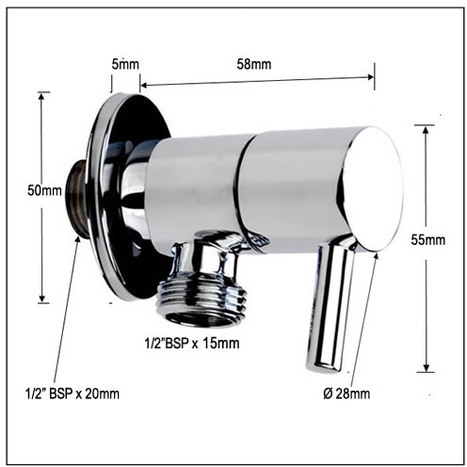 This is a very high quality chromed 1/4" turn ceramic valve. I fitted it in a chromed back plate 90, but if you want to build in the pipework, it even comes with a cover plate. Solid build, good packaging and prompt shipping. Have been using this company for about 5 years now and will use again. Always get my bidet shower parts from here. Very quick delivery and good product. Cheap price but good quality. Good solid product,good value and delivered next day. VAL0800: 1/4 turn Ceramic lever bar Water Isolating Angle Valve. 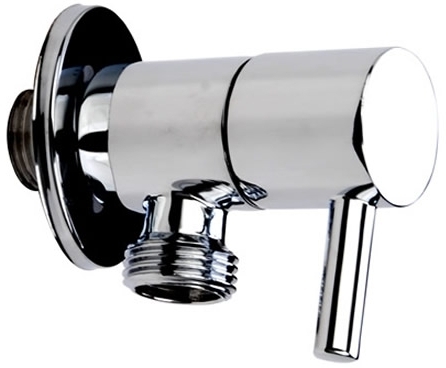 Manufactured in solid Brass with mirror chrome finish and ceramic valve plates.